I had a fun time making this little project. This idea has been floating in my head for about a year or ever since I made these last year. After making them I realized, 'Wait! I need to make actual envelopes!' 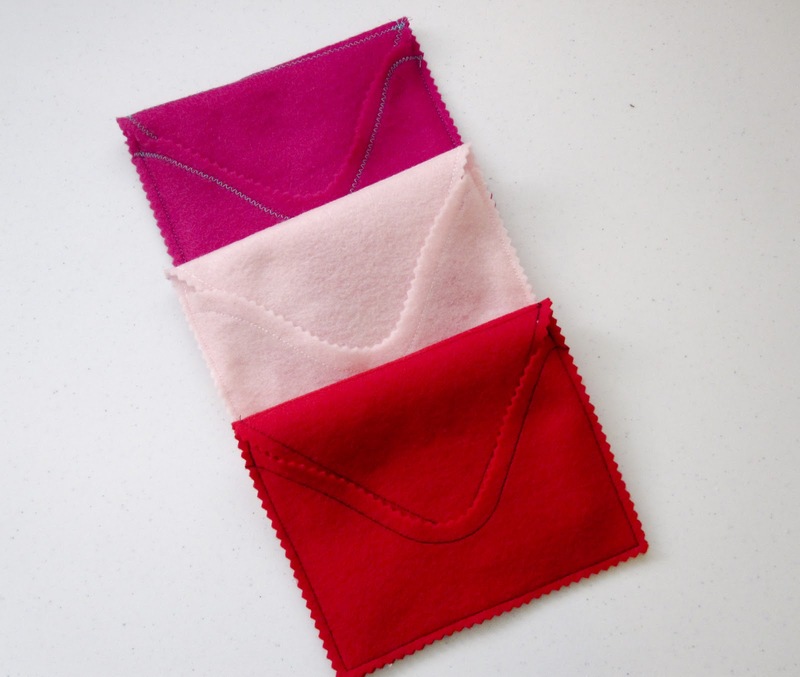 I've had these sweet little envelopes done for about a week but due to a crazy schedule since making them, I am just now posting the tutorial. 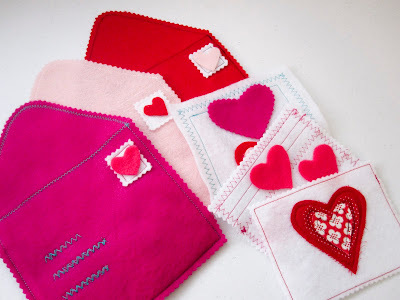 So here is a fun Valentine tutorial, better late than never, and before the holiday! Valentines ready to be stuffed and delivered! 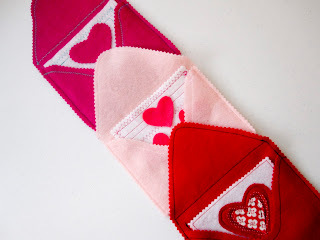 Tuck in the flaps to keep those Valentines safe! 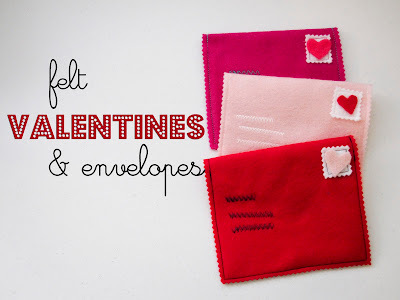 Note: You could make 'regular' envelopes to have for pretend play all year. Just make the envelopes out of gray or blue felt. Finished Size: 6.25" x 5.5"
2. 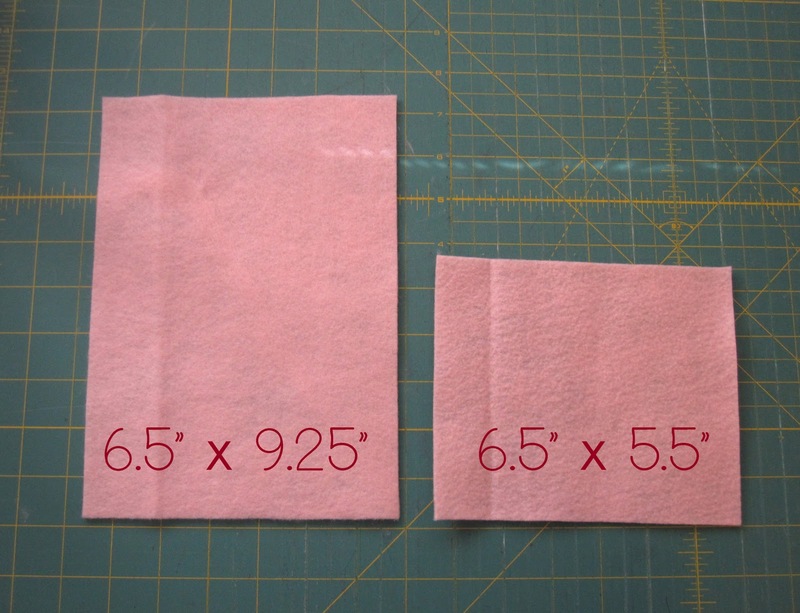 On the larger piece, measure up 5.5" and mark with disappearing ink pen across the entire envelope. 3. Take template and place on the mark you made as shown below. Trace around the template. 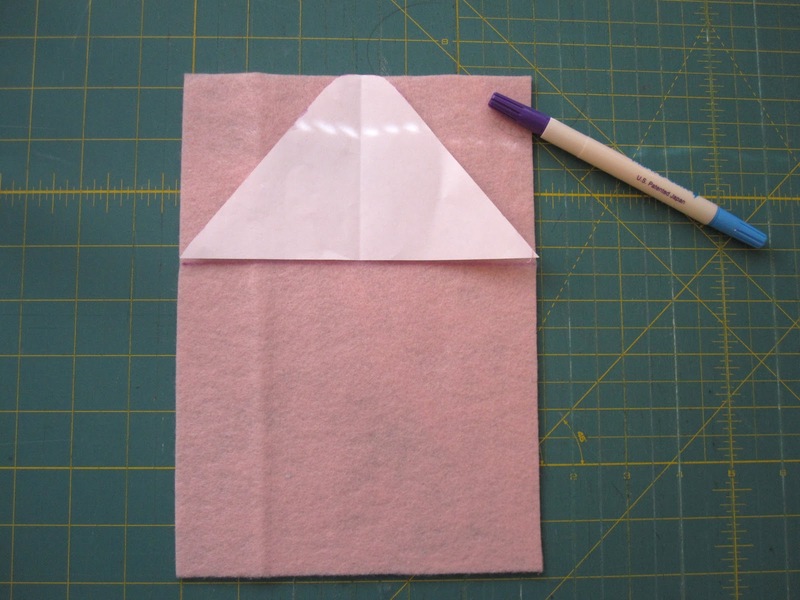 This will mark the flap of the envelope. 4. On the smaller piece, place the same template along the top edge of the felt. Trace around the template. 6. 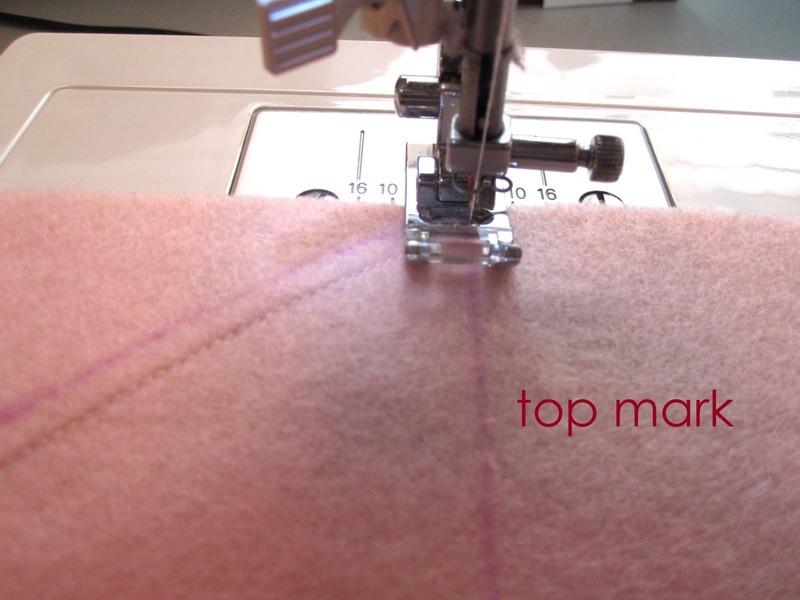 Take the larger piece and line up the right diagonal mark with the edge of your presser foot. Sew all the way around the flap until you get to the top mark going straight across the envelope. 7. Now line up your needle with the mark going across the envelope. 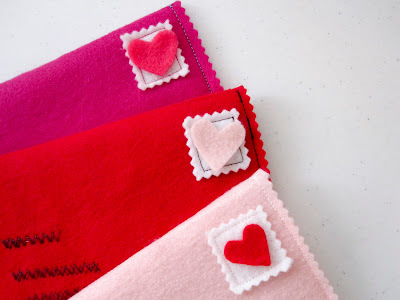 Sew until you get to where you started sewing. Backstitch. Place aside. 8. 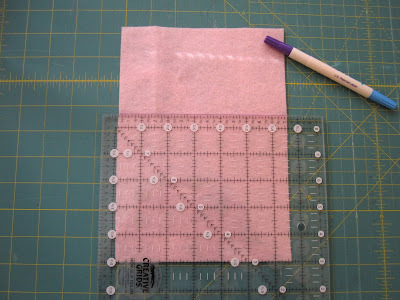 On the smaller piece, measure down about 1" on each side. 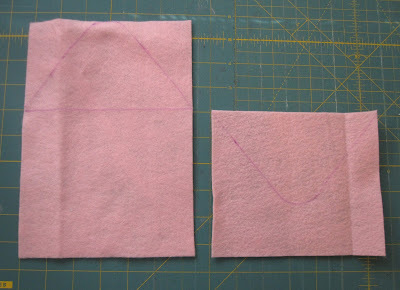 Make a rounded edge like shown in the picture below. 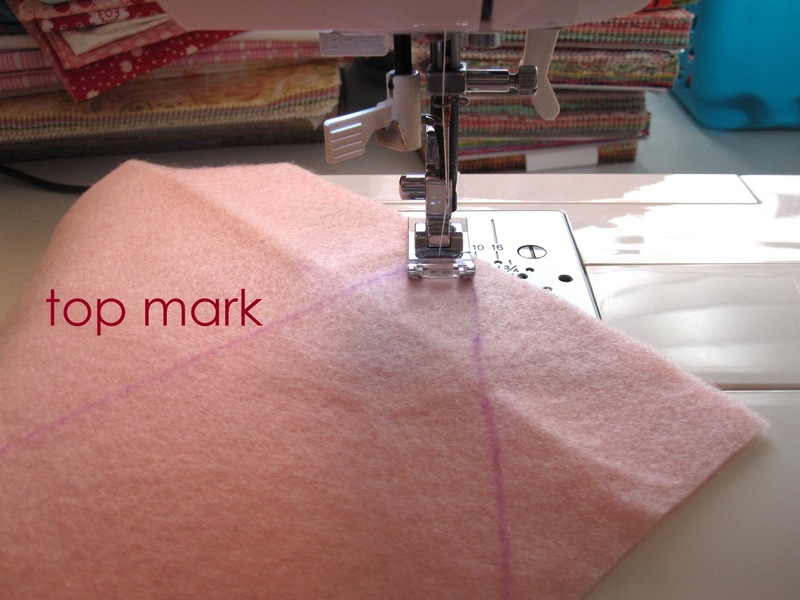 Sew, lining up your needle with the mark and following the rounded marks you just made. 9. 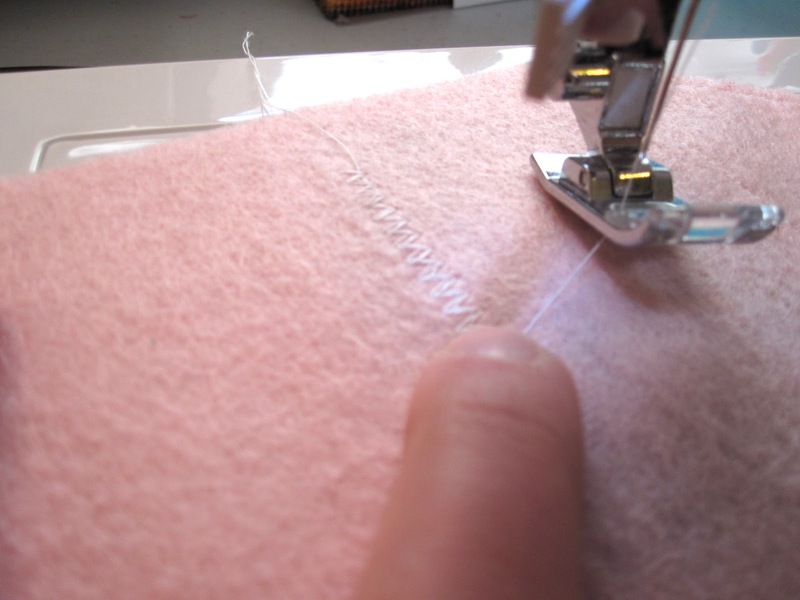 Trim along your sewing lines with pinking shears. 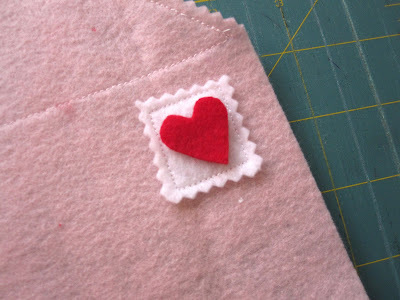 On the front piece of the envelope I trimmed about 1/8" - 1/4" away from my sewing line. On the back piece, I trimmed about 1/2" - 3/4" away from my sewing line. 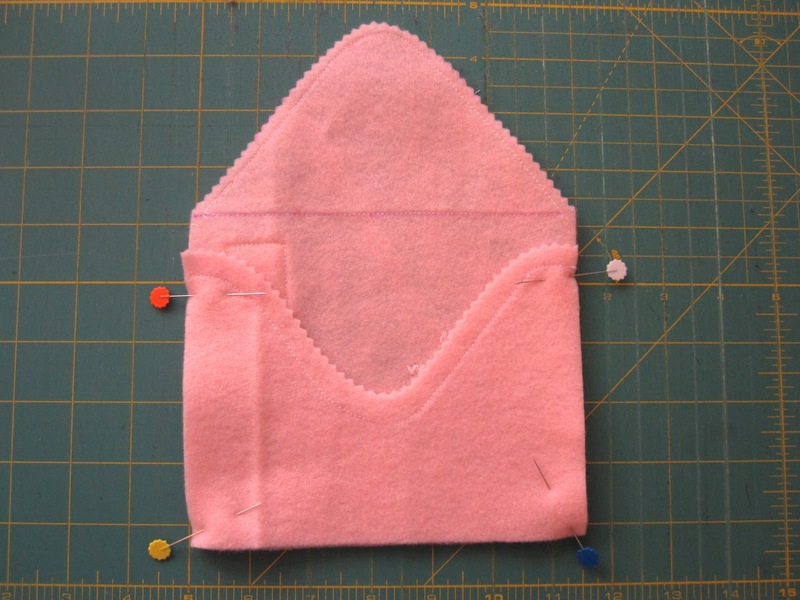 Make sure you trim further way from the sewing line on the back piece so you can tuck in the flap. 11. Cut a little square out of white felt. (I used pinking shears and mine was about 1 1/2" square.) 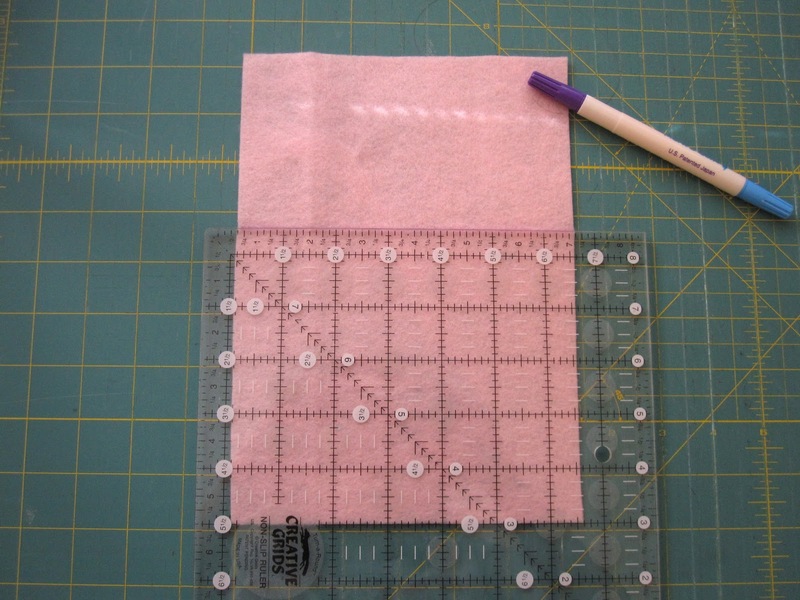 Sew the square in place in the upper right hand corner. (About 1/2" away from the edge.) Hot glue or tacky glue on a little heart. Or if you have a little helper, have them use tacky glue to glue the heart in place. 12. 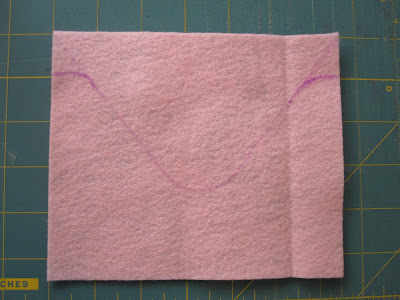 To make 'writing' on the front of the envelope I just used a wide zig-zag stitch. 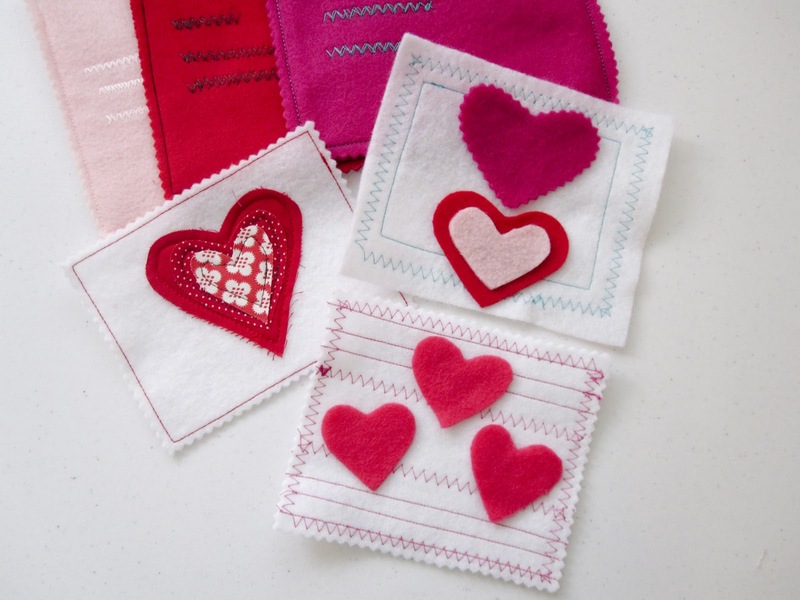 Or you could embroider names. To make the stitching stand out I sewed then I backstitched all the way back to the beginning. Then I sewed normally again. 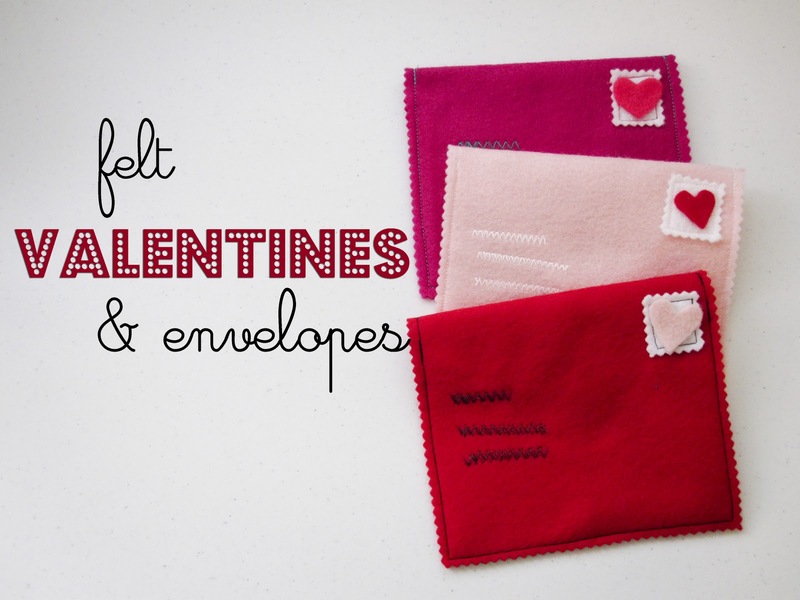 When you are taking the envelope off your machine don't pull it off quickly. This will cause the thread to gather and bunch up. Just gently pull your envelope out from under the presser foot just enough to put a finger on top of where you stopped stitching. 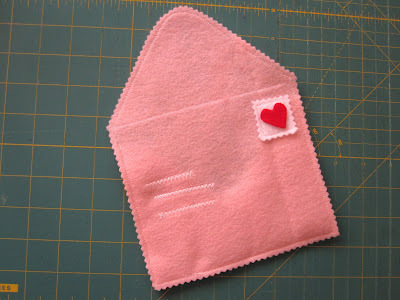 Then pull the envelope off the rest of the way with your finger holding the threads in place. 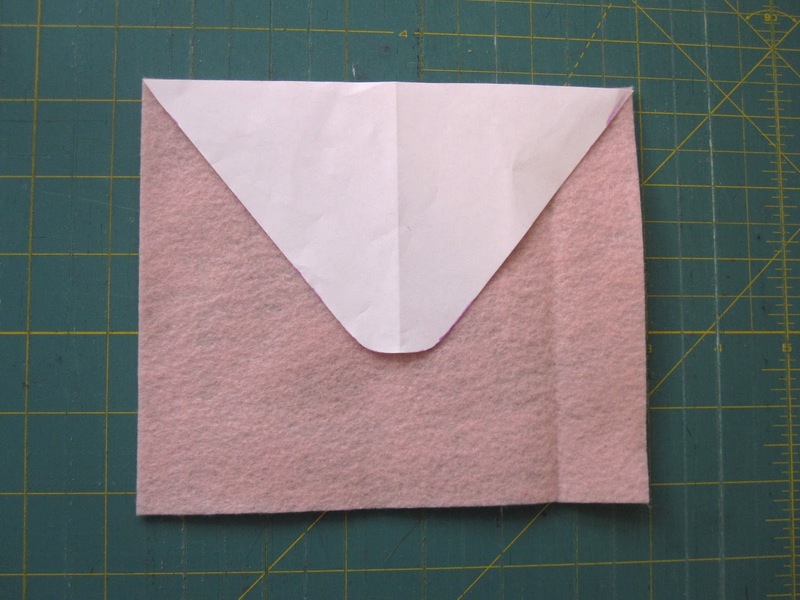 13 With the front of the envelope right side down, place the back of the envelope on top. Pin in place as shown. 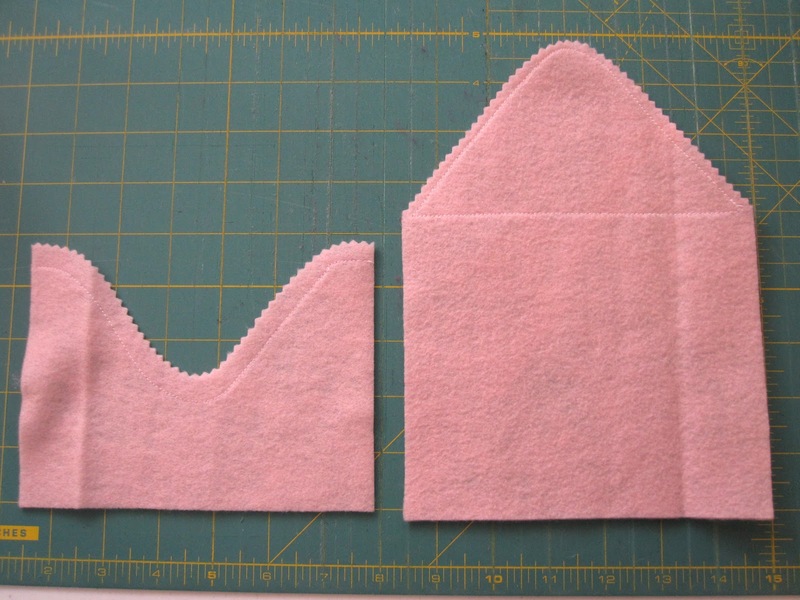 Sew the two pieces together using 3/8" seam allowance. Start sewing at the top mark going across the envelope and continue sewing to the other side. Backstitch at the beginning and end. 14. 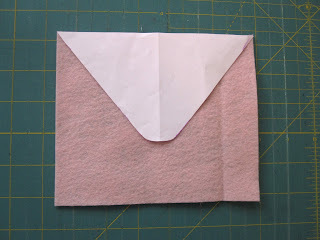 Trim the rest of the envelope with pinking shears! Fun, festive, and relatively fast! Have fun making these fun Valentines! darling, darling, darling. That is all I am going to say. oh no! The template link is broken. I can't seem to find the template. I tried clicking on "here" to download the template in PDF and it just brings up google docs. Help! Sorry everyone! I've repaired the link and it should work. 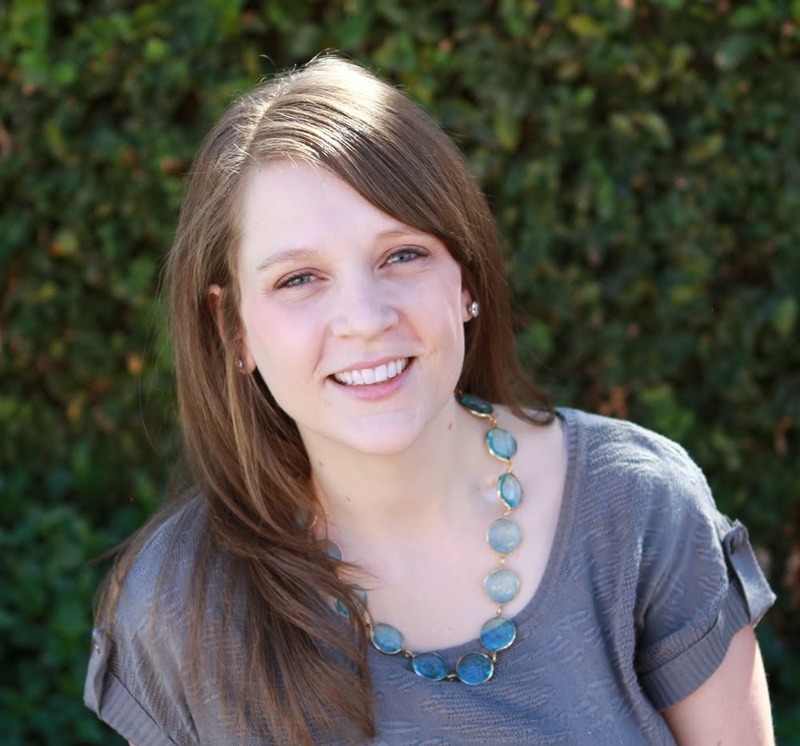 If it isn't just email me at everydaycelebrate at gmail dot com. I love these ! I found some cute ones like these at JoAnns and I need more... I might just have to make my own! Thanks for the simple directions!